At over 8 miles long, with over 23 miles of shoreline, Lake Cushman is a popular destination for outdoor recreation, like: hiking, camping, fishing, boating and kayaking, just to name a few. Homes for sale here are typically well-established single family residences or custom cabins, and may offer waterfront property, acreage or both. The area's most well-known attractions and features are the Cushman Dam No. 1, access to the Olympic National Park and breathtaking views of Mount Ellinor, Mount Rose and Mount Washington. Though there are many small grocery marts and cafes in and around the resorts of Lake Cushman, the closest major city is Hoodsport, less than 30 minutes away where residents can find shopping, entertainment and employment opportunities. 1 Beds | 2 Baths | 2052 sq. Ft.
2 Beds | 2 Baths | 1640 sq. Ft.
Blue Summit Realty has the most accurate and up to date Lake Cushman real estate listings on the web. Currently there are 21 homes for sale, and 45 vacant land properties in Lake Cushman. Of the 66 total Lake Cushman residential listings for sale 0 are bank owned, 0 are short sales, 0 are new construction, and 0 are townhomes. The price ranges from $74,900 to $0 with a median list price of $245,771 and median sold price of $122,829. Make sure to refine your Lake Cushman real estate search by property type, price, square footage, bedrooms, bathrooms and more with the search tool above or view the Lake Cushman listings on our interactive map. 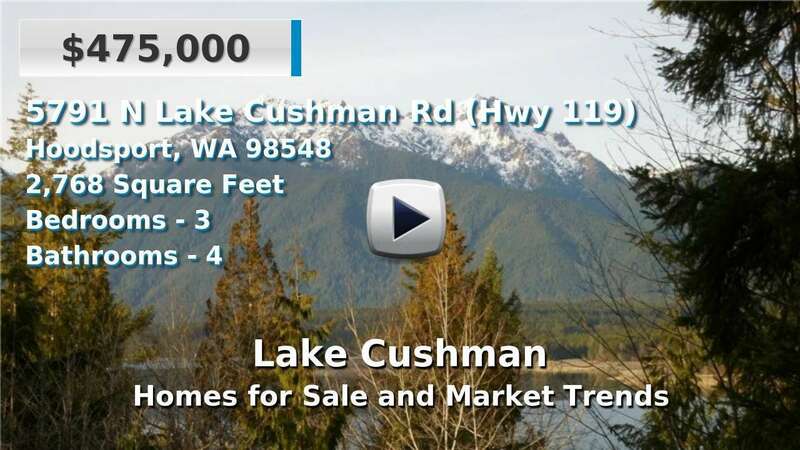 Our Lake Cushman real estate listings were updated 11 minutes ago.